Hinge vs Tinder - What’s The Difference & Which Is Better? 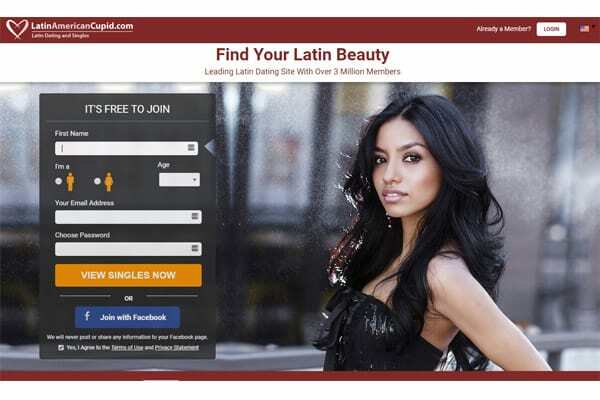 Not sure which dating app will get the best results for you? 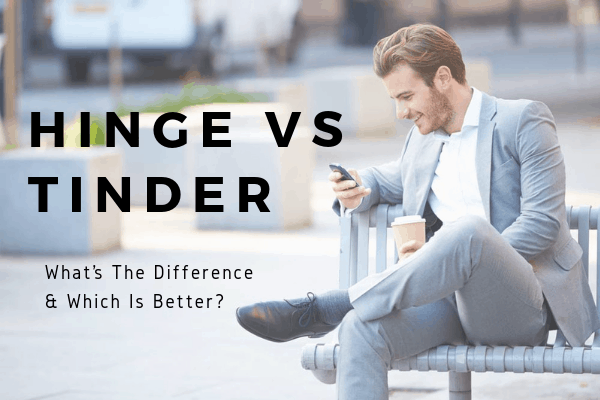 If you don’t have time to manage both, this Hinge vs Tinder comparison will help you make the best choice! With a tagline of “Designed To Be Deleted,” Hinge makes its mission clear – it wants to get you into a serious relationship. Its core user base is millennials, making it the perfect dating app for anyone in their 20s and 30s who is looking for commitment. Because of its more “serious” nature, the singles you’ll find on Hinge tend to be successful and intelligent. Tinder, on the other hand, has sheer numbers in its favor. It’s still the most popular dating app in the US, which means overall you’ll likely get more matches. 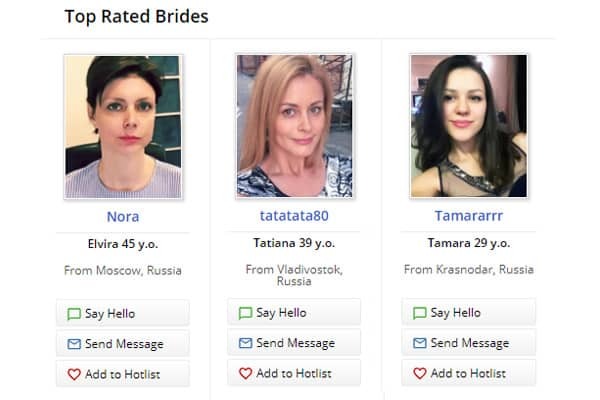 You’ll also find users of ages on it, looking for everything from one night stands to marriage. Hinge, if you’re under 40 and seeking something long term. Tinder, if you want to casually date and/or you’re not a millenial. This is one of the areas where Hinge and Tinder are pretty different. Free Hinge users can only “like” 10 profiles a day, while free Tinder users can swipe right up to 100 times every 12 hours. If you want the ability to pre-screen your matches for whatever preferences you have in mind, Hinge is the app for you. You also have the ability to specify any number of those preferences as a “dealbreaker.” You won’t see profiles with characteristics that match any of your dealbreakers, so it’s a great way to save time. Both apps will show you who they deem highly compatible matches. Tinder has “Top Picks,” which is a selection of profiles the matching algorithm feels you’ll “like” based on your swiping history. But free users can only “like” one Tinder Pick each day. If you want the chance to match with all your Top Picks, you’ll need a Tinder Gold subscription. Hinge has “Most Compatible,” which is exactly what it sounds like. According to Hinge, these are matches you’re 8x more likely to go on a date with. The app even has a built in way to fine tune its matching algorithm – the “We Met” feature. After a phone number has been exchanged with a match, Hinge will follow up in a few days by asking if you actually met your match in person, and if so whether you want to see your match again. If you have a fairly set idea in your head of what you’re looking for in an ideal partner, Hinge’s screening capabilities will save you from matching and messaging with people you’d never actually date. If you want a broad overview of who’s available in your area and don’t mind putting in the screening time, Tinder will likely net you more matches overall. These two popular dating apps are fairly evenly matched in this particular arena, with the exception of how many more profiles you’re able to “like” on Tinder each day. But all the basics, including downloading the app, creating a profile, matching and messaging are free. It’s a draw. You can successfully use both without spending a penny. Hinge’s premium membership is called Hinge Preferred. The price ranges from $4.99 to $12.99/month, depending on whether you subscribe for 1, 3 or 6 months. Tinder has 2 levels of premium membership: Tinder Plus and Tinder Gold. Tinder Plus costs around $9.99/month if you’re under 30, and if you’re older it bumps the price to around $19.99/month. The cost of Tinder Gold depends on your location and age, but you can expect to spend between $12.50 and $29.99/month, with membership lengths varying from 1 month to 1 year. In terms of sheer cost, Hinge wins with the $4.99/month price tag (when you commit to 6 months up front). But Tinder offers premium features that Hinge doesn’t have, such as the ability to limit who can see your profile, and control what information is displayed. If you want a dating app where you can hide your profile, Tinder is the way to go. Tinder also allows you to undo a “nope”, but there’s currently no option to undo a “skip” on Hinge. So if you’re prone to that particular error, you may want to stick with Tinder. 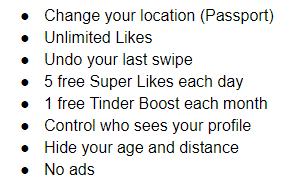 If you want the most features for your money, such as the ability to “Boost” your profile temporarily to get more views, Tinder wins. Hinge profiles consists of 6 photos or videos, and your choice of 3 “prompts” to answer. There are more than 80 to choose from, and the selection changes often. You must upload all 6 photos/videos if you want to “like” other profiles. Each prompt has a maximum character count of 150. Your Hinge profile will display everything that you’re screening for in your matches, i.e. height, age, and location. If you’re a Preferred member and screening for kids, drugs, and education level, your setting for those preferences will be displayed on your own profile as well. Tinder profiles consist of up to 9 photos, and you also have the option of including 2-second video snippets that will play on repeat, called “Tinder Loops.” You’re only required to upload one photo. Tinder bios have a 500-character limit, and aren’t required. Unless you’re a premium member and choose to hide some info, your profile will display your name, age, distance away, occupation and education. If knowing as much as possible about your matches is important, Hinge is the clear winner here. Messaging on Hinge and Tinder is similar in that once you’ve matched with someone, you can exchange messages for as long as you want. Tinder has a similar feature called Tinder Feed where you can comment on someone’s recent activity, like changing their bio or updating a photo. But you have to match with someone before they’ll show up in this view. Hinge. If someone is on the fence between “like” and “skip,” being able to sneak an awesome icebreaker in with your “like” could convince someone to match with you who may not have otherwise. Hinge VS Tinder: Can You Use It Without Facebook? Hinge wins here as well – you can create a Hinge account using your mobile number, no Facebook required. Tinder still requires a Facebook account to create a profile. Hinge allows you to connect Instagram to your account. Tinder allows you to connect Instagram, Spotify and Snapchat, so you can use Bitmoji and choose an anthem and your favorite artists. Tinder, especially if you want to spark a connection via shared taste in music. Start with Hinge if you’re seeking a serious relationship – not only is the overall quality of matches likely higher, but you can more carefully curate which profiles you see as well. Hinge is also the better bet if your messaging game needs a bit of work; the app’s interactive approach to profiles makes it easier to start a conversation. If you’re looking to date more casually and want quantity before you worry about quality when it comes to matches, Tinder will probably make you happier. But no matter which dating app you decide to try first, you’ll need a profile that attracts “likes” in spades. For plenty of expert profile, photo, and messaging advice, check out our Ultimate Guide To Tinder and our Ultimate Guide To Hinge. Or meet the most desirable singles in your area the easy way – by bringing in the dating experts at VIDA! Our professional writers and photo editors will do everything for you, from determining your very best lineup of photos to writing a compelling profile – and handling all the messaging too. Your dedicated matchmaker handles all the screening for you, so all you have to do is show up for all the dates with amazing people who meet all of your specified criteria! Incredible results – none of the work. Sound good? Click here to learn more!